Tyler was working his way along the rock face when he suddenly snapped his head back around the corner. He looked at me, eyes wide and face in a state of shock, and stuttered out a warning. I was a few feet behind on the narrow rock terrace that served as a pass between the sheer face and the raging Toklat River. We had been backpacking in the Denali National Park backcountry for a few days and were heading down the river towards the park road, still six miles distant. A strong wind was blowing upriver, making it unlikely that any bears around the bend would be able to smell us in our current positions. “How close?” I asked as Tyler somehow passed me going the other way. I saw a gravel bar, but it was just yards away. Surely that wasn’t what he meant. “But that’s only…” was all I could vocalize before I saw an image that will be forever burned into my memory: the head of a golden-brown grizzly bear poking around the corner, a stark contrast to the gray water and the black rock. It was no more than 20 feet from me. “Oh crap!” I said, and I quickly followed Tyler away from the bears. 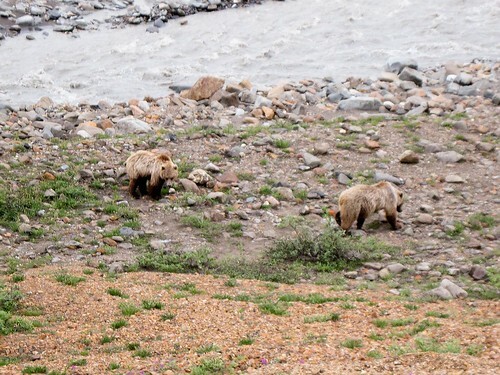 One by one, three grizzlies sauntered around the rock face by wading through the rushing water. Clearly, they were not concerned about being swept downstream. It was a mother and two cubs. Tyler and I continued our retreat while waving our hands above our heads and yelling, “Hey bear!” The knowledge that most of Denali National Park’s grizzly bears were vegetarian provided little reassurance, as a physical encounter in our situation would have been about a mother protecting her offspring rather than predation. 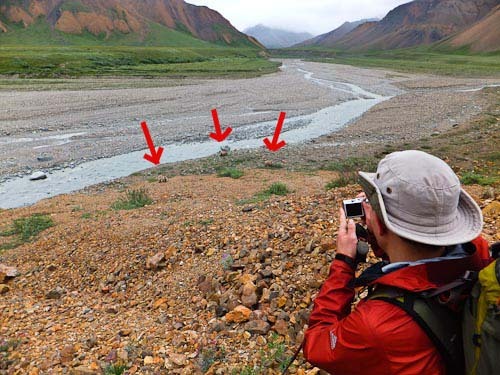 Since the bears seemed to be set on going up the bank of the river, and we couldn’t cross the river’s narrow, fast channel, our only option was to scramble up a steep talus slope. We managed to put about 50 feet between us and the river — and thus, between us and the bears. Grizzlies! Much closer than the ones at Banff. Fortunately, the bears appeared to be as uninterested in us as they were in moving quickly. They took their time wallowing up the bank, pausing for long intervals to sniff various interesting rocks and shrubs. We continued to wave our hands and yell. Ten minutes after it started, our close encounter with one of North America’s most powerful animals came to an end. The bears moved out of sight upriver. Tyler and I breathed sighs of relief and continued our downriver trek.